• What sets Columbia Green Technologies apart from other green roof systems? 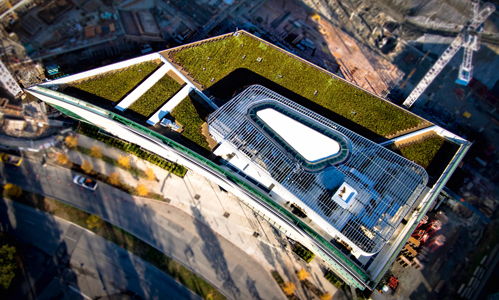 Design Flexibility: We offer both layered and tray green roof systems. We can help you find the most appropriate green roof solution for your project. Warranty Options: We partner with roofing manufacturers to offer single source roof/green roof warranties over a variety of membrane types. See our ‘Partner’ page for a complete listing. We can also offer dual warranties, as dictated by the project requirements. • Does Columbia Green install Green Roofs? No, we manufacture the green roof system components and coordinate sourcing and delivery of growing media, plant material and the green roof system to the job site. Licensed contractors, please inquire about our Certified Installer Program. •Where do your plants and growing media come from? It depends on the project location and plant selection specified. We source plants and growing media from well-known suppliers throughout North America using our national network of licensed vendors. We locate material as close to the job site as possible. Contact Us for more detail. • How heavy are your green roof systems? This PDF includes a weight range for different system types and depths. Weights listed include the green roof system, growing media, and the plants. Look at the ‘Saturated Weight’ to determine the maximum weight of the system- when it is fully saturated by rain. System weights will vary by location due to the different regional materials sourced for our growing media mixes. Please contact us for detailed calculations for your specific project. •What are my planting options? Our policy is to provide plants per project specifications, provided they are drought tolerant and appropriate for the depth of the system and project climate. We offer sedum tiles and mats, sedum cuttings, and plugs, as well as small accent grasses and bulbs in 4-inch size pots or smaller. We also offer pre-grown trays. We are happy to work with you to provide suggestions on plant selection for a specific project location. • Are there restrictions on plant choices? Bamboo and other plants known to have aggressive root systems or deep taproots are prohibited. Columbia Green Technologies does not provide nor warranty plant material in 1-gallon or larger containers. However, if you are designing an intensive green roof with these types of plants we will permit a landscape contractor to source this larger plant material for use with our intensive system (provided there is sufficient growing media depth). • Are the Columbia Green Systems compatible with Electronic Vector Field (EVF) leak detection? Yes. We do not supply EVF, but it is absolutely compatible with our green roofing products. • I’d like to put a green roof on my single-family home. Who should I contact? At this time Columbia Green sells exclusively through our network of certified installers. For single-family residential projects, we suggest contacting a local landscape or nursery supply company for assistance locating growing media and green roof plants. • Why select a tray-based green roof system? Each situation and building is unique, but some of the common reasons to choose a tray system include: Maximum stormwater retention capabilities, easy installation, and optional integrated irrigation. Our systems page has more information on this topic. • How is your tray different from others on the market? – The Columbia Green Technologies tray is designed with stormwater management in mind. The ridge and trough system at the base of the tray is designed to reduce peak flows. – The interlocking tray system forms a monolithic installation and prevents growing media from reaching the roof membrane. – Design flexibility: We offer both pre-grown and planted-in-place assemblies. – FM Approved. Third party fire rating testing and verification. – Single-source ‘roof to green roof’ warranty. Please visit our partner page. • What are the tray dimensions? Our tray is 24” x 24” and is 4-5/8” in height. The wall thickness is 100 mil. Because of the unique interlocking system, our trays can be overfilled with up to 8″ of growing media depth. See more about our Planted-in-Place tray system on our ‘Green Roof Systems’ page. • Are the tray modules visible? How are they held together? No, planted-in-place trays are designed to be overfilled to conceal the tray edges for a uniform look. They can be filled with 4-5/8” to 8” of growing media. The trays are designed with interlocking edges and secured together with pins. • Can the trays be pregrown with plant material? Yes, but in that case the growing media depth is set at the height of the tray, 4-5/8 inches. • What edging options are available for your green roof tray systems? Please see the ‘Systems’ page and our standard details. • Is the tray made from sustainable materials? The tray is injection molded with 88% post-industrial recycled polypropylene and can be recycled at the end of its useful life. All tray ingredients have been voluntarily disclosed via the Living Building Challenge Declare label. Our tray contains no ingredients on the ‘Red List’ of harmful ingredients. • How is the optional integrated drip irrigation system installed? The tray is molded to securely hold the drip tubing. We supply the header and components inside the perimeter of the tray layout, including; drip tape, tape ell’s, drip tee’s, compression barb fittings, threaded male point of connection for the header and a capped fitting for the opposing end of the header. All valving, backflow prevention, controls, and valve boxes are supplied by the installer, including getting the water source to the edge of our header/edger. • Why select a layered green roof system? 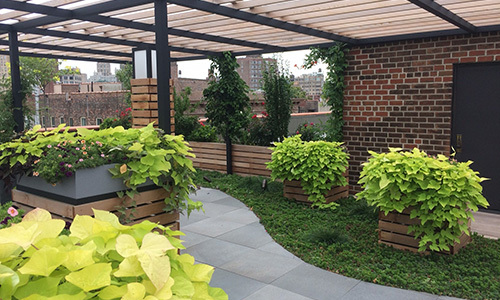 Each situation and building is unique, but some of the common reasons to choose a built-in-place system include: when the structural capability of the structure is a limiting factor, organically shaped layouts, 5” or less of growing media is desired; for intensive roof gardens. Please see the system page for more information. • What are the components and functions of the layered system? Drainage Layer: critical for preventing ponding and moving excess water across the roof surface to the nearest drain. Filter Layer: To prevent soil fines from migrating downward onto the roof membrane. Water Retention Layer: Functions to supplement the water, nutrients and anchorage available in the lightweight, engineered soil. Growing Media: lightweight media available in a variety of blends (all meeting FLL guidelines) to suit your specific project needs. Depths can range from 3” to 24” or more. Plants: Layered systems can be planted with sedums, bulbs and other drought-tolerant plants hardy to your region. Sedums are available as cuttings, plugs or pregrown tiles. • Which layered system should I use? Extensive Layered System: For green roofs with depths ranging from 3″ – 6″. Semi-Intensive Layered System: For green roofs with depths ranging from 6″ – 12″. Intensive Layered System: For green roofs with depths of 12″ or greater. • How is the Layered System installed? See the installation video posted on the home page. • What type of irrigation should I specify with the layered systems? It is suggested that a standard overhead spray type system be used with our layered systems. We have seen excellent results with the use of MP Rotator heads. • What are the FLL guidelines? FLL is an acronym which stands for the German term Forschungsgesellschaft Landschaftsbau Landschaftsentwicklung e.V. Germany, a pioneer in the roof-garden industry, has set rigid standards to ensure excellent multi-decade performance. Our media mixes meet these guidelines. Tests establish dry and saturated densities, particle-size distribution by mass, saturated-air porosity and hydraulic conductivity. The objective is to provide a sterile, soil-less medium that is lightweight, yet able to hold large quantities of rainwater while allowing the plants’ roots access to sufficient oxygen, even when saturated. The FLL standards also help to prevent compaction of the growth medium. • What is the maximum slope for your systems? Our green roof systems can safely be placed on roofs with slopes at a maximum of 2:12. Slopes greater than this need additional measures taken to support the vegetative assembly from “sliding”. Contact us to find out more about our slope retention system for slopes steeper than 2:12. Systems cannot be placed on roofs with slopes greater than 6:12. • How do you mitigate wind up lift with your systems? Wind up lift can be mitigated in a number of ways, but before formal design begins the designing architect or engineer needs to calculate the building requirements based on ANSI/SPRI RP-14. Please contact us with additional questions. • Who should I contact if I don’t see my question answered here? Send us an email us at info@columbia-green.com or call 503-327-8723.